2) Use the neat feature, "scale to frame size", which can be set up as the default for these types of projects. If you pick 2), as it is certainly the easiest, you have lost all your oversampling advantages. Really! This scale happens BEFORE any of your timeline based filters see the data. So 4K images on a 1080 timeline becomes only a 1080 source when you zoom in; push in more than 20% and the image will get soft. There is nothing wrong with 4K on a 1080p timeline in this mode, as long as you remember to turn that feature off when doing any re-cropping, it is just too easy to forget. If you go with solution 1), you still have your oversampling benefits for re-framing. But now you have to be careful as the NLE is doing the resize not the importer, so you have to make sure all your scaling filters are deeper than 8-bit, otherwise you will have lost precision. Adding a motion filter would seem best, as the Premiere motion filter does support 32-bit processing -- within Prospect HD/4K you can turn on the feature that displays the depth of the filter stack (handy to confirm you are maintaining quality.) This additional scaling step can make things slower during your edit. The better solution is to do your edit at your largest source resolution, i.e. editing 4K at 4K and 2K at 2K. Set the "scale to default size" on so any lower resolution media (e.g. over-cranked sequences) are scaled to fit (no issues with the upscaling.) There are no limitations to doing this, particularly as Prospect 4K already dynamically decodes larger source data to half or quarter resolution as needed for editing speed. There are many advantages, such as freeing the range of output options for frame size and frame aspect, to be performed at maximum quality. 4K within a default scale to frame 1080 project, will have a little poorer 720p exports, as scales would be 4K to 1080 then 720, rather than 4K oversampling and scaling directly to 720. I've received some feedback to suggest some feel that zooming into 4K frame in a 4K timeline would result in softer images than the same source in a 2K timeline; they are missing the fact that oversampling happens upon export to whatever the target resolution may be, not how it previews at 100% pixel view on the timeline. When pushing into a 4K frame, within a 4K project, you can check your sharpness at 1080/2K by setting the program window view to 50%, or look at the 1080p feed over HDSDI, both will allow you to see if you are pushing in too far and preview the quality of the final output. While instinct tells us for most projects a 1080p export will be plenty of resolution, that doesn't automatically extend to being the ideal timeline format, particularly for oversampled re-framing. As a gift for my 40th birthday, my wife got me the awesome 2nd gen. iPod Touch. 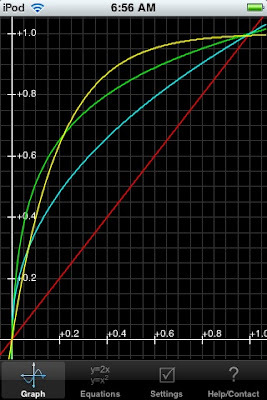 I've been playing with a Graphing Calculator app, experimenting with various video encoding curves. It is Friday and time for another beta release. Version 3.4.3 contains some cools upgrades and fixes, particular for Premiere support, but there are base level codec changes for NEO as well. In Premiere we have renamed all the appropriate filters to it have 32-bit in their name (Prospect HD/4K only.) It's handy to know, but it is also great for selecting filters, just put "32" in the search field and up pops all of the CineForm deep pixel filters. One of the long missing 32-bit filters is a Levels plug-in -- Finally! The Premiere levels control is only 8-bit, limiting it usefulness, while the Premiere Fast Color Corrector include 32-bit levels, it is pretty slow. This new filter is fast and simple to use and plays back in real-time. As computers are getting faster the scrubbing will remain in 32-bit mode, unless you turn that feature off. Previously we switched between 32-bit and 8-bit to get a small improvement scrubbing speed, but it made high dynamic range work more painful. I think you will prefer it this way. YC scopes now work correctly. Previously they clipped at 100% even if the data did not clip. That was also a related bug in the last few builds that clipped 107 IRE from YUV sources, that is now fixed. Of course let us know if there any introduced bugs, but if you are not in the middle of a big project, this is a beta worth trying out. PHD/NHD is on the build machine.